We had a tree hit by lightning and we lost a large branch. My husband cut most of it up and was complaining about cutting the last piece. I looked at it and saw a dragon. I told him not to cut it, but just move it to the middle of the yard. I spent 20 minutes painting it and my neighbor, husband and my childcare fell in love with it. My neighbor was cutting a tree down and offered the major portion for another dragon. So now we have two Komodo dragons in our backyard. I studied Art at the University of Nebraska 30 years ago, but carpal tunnel limited my drawing and painting days. I love to make things and found I had a knack for creating toys out of wood and natural material. 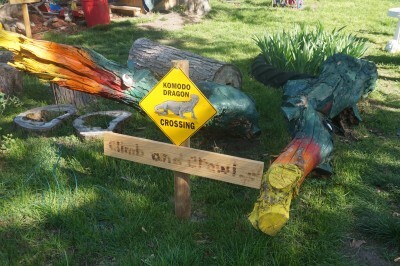 I started creating areas in my yard that encouraged the children to be outside, play, and learn about nature. I built a mud kitchen first. I loved it. The children seemed fascinated with butterfly and bird watching, so I built an area for viewing those. They tried to build a tent out of the logs and wanted to pretend to camp. So, I built another area. The children kept digging holes in our backyard so I decided to create an area for them to dig. I was given a pallet and decided to build a garden center. The more I built the more I wanted to build. I also had a parent who was an arborist and he informed me we needed to remove a tree and cut a limb down. He finished most of the job and left several large pieces of the trunk, asking if he could back the next day to finish. The pieces were hollow throughout and the children loved climbing in and out of them. I asked if he could leave them. This later became our climbing and crawling area. That same dad started bringing me cool pieces of wood and tree cookies from his job. A year and a half ago, I decided to become an accredited Family Child Care with the NAFCC. At the time of this writing, I am the only one in the state. I chose to do an ITERS (Infant, Toddler Environmental Rating Scale) with the NAEYC to prepare for the process. During my final evaluation for that process, the inspector said to me, “You should talk to Traci Gordon about becoming an Outdoor Classroom. You already have most of the areas.” So I called. And she was right. We added some signs, some storage, and tables. We took out several plastic or metal pieces to create space and moved items to create defined areas. We were very nervous about how the children would react and how it would look. The children loved it and our backyard looks even better. They started referring to my backyard as Aunt Shelley’s Playground. I am always amazed at how much time we spend outside and how much my children learn from being outside. I love my space and so do my children. They enjoy being outside more than ever and I never hear “I am bored”. I truly feel blessed with wonderful parents, children, and an incredible outdoor classroom.